Fantastical 2 brings a new full calendar application for OS X Yosemite and uses its very useful natural language parsing. This means that you can enter your entry in the same way you'd say it, and Fantastical will make sense of it and create an entry for you. If, like me, your muscle memory leads you to popping up Alfred anytime your brain wants to make a note, add a calendar entry or a reminder, these few workflows will satisfy your needs once you've installed Fantastical 2 on your Mac. With Robert Böhnke's workflow, you can add an Calendar entry by typing "cal" followed by your natural language entry. Fantastical will do the rest of the leg-work to add the entry to your calendar. 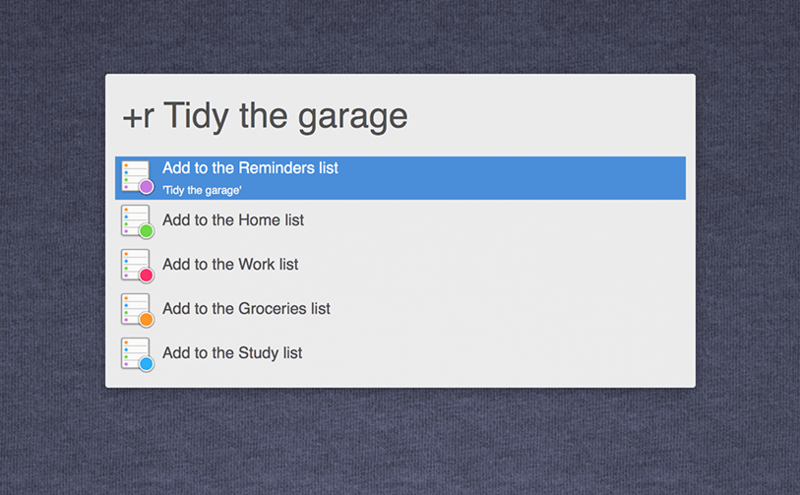 You can also add Reminders using Jono Hunt's Reminders workflow. This workflow uses a few keywords to allow you to add the reminder to the most appropriate list, using the same Fantastical natural language parser. Typing 'w finish the report' would add that task to the list named Work. Typing 'r pick up dry cleaning sat at 6:30pm' would add that task to the list named Reminders with an alert set for 6:30pm on Saturday. Typing 'g milk' would add that item to the Groceries list. Alternatively, you can use _"+r" _as a keyword to see all your lists. You'll then get a Notification Centre notice that the item has been added to your Reminders list. Workflows don't get much simpler than this, but a workflow doesn't have to be complicated to be useful. Veteran Alfred user Ryan Block contributed this workflow to launch Fantastical 2 using the keyword "calendar", so that you don't have to remember the app's name in order to launch it. Of course, you can top up this workflow with any other useful keywords for your own use. With these workflows and Fantastical, you'll never forget an appointment or task again!